Wow…just wow! 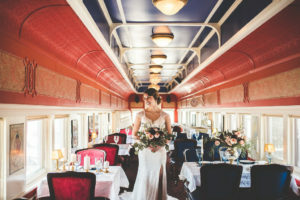 The Orient Express Wedding Photoshoot is one of my favorite photoshoots I have ever designed. For over a year, I had wanted to coordinate and design a photoshoot at the Winnipeg restaurant Resto Gare. I can’t believe it’s finally become a reality! 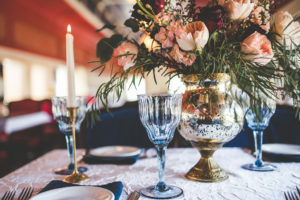 Inspiration for this shoot came from the Orient Express Train that ran from 1883-2009 in Europe. This train was all about luxury! The train addition at Resto Gare gave the same luxurious look, featuring bold hues of red and blue. With such a beautiful venue, I wanted to keep other design aspects of the shoot very classic and minimal. 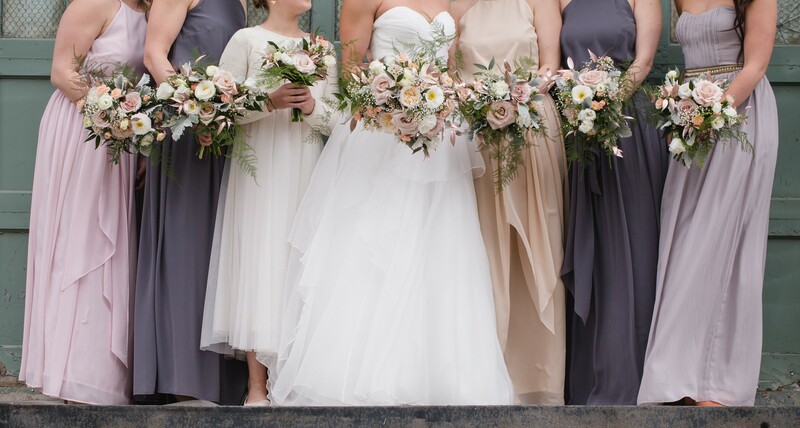 I had the incredible chance to work with, Anna Lang Bridal, Something Borrowed, The Flower House Winnipeg, Xandra Photography, Primped & Polished and Hannah Baker. These women took a chance on me and my design concept, and brought it to life. When designing a shoot, I truly believe it’s a collaboration between all vendors. I come up with the general concept and allow vendors to add their own special touch. This gives them a chance to try new techniques or trends. Like this look? Alexandra Lillian Weddings & Events offers wedding design for our full planning clients. Contact us today to arrange a complimentary initial meeting. The Big Day Wedding Expo was a hit. I’m so proud of myself for taking the leap and investing in a wedding show. I won’t lie… it was a lot of work to pull everything together but it was totally worth it. Designing my booth and meeting all the wonderful brides-to-be made for such a wonderful experience. Clean, crisp, and fun is how I would describe my booth. As a lot of my weddings have some outdoor portion to them, I made my booth feel like Spring. I did this by bringing in funky AstroTurf carpet. Let me tell you, finding AstroTurf in in the middle of winter is not easy. I tracked down the one Rona in Winnipeg that had some in stock and purchased their last few rolls. The green added an extra pop and warmth to my booth, especially on a chilly March weekend. For detailing on the walls, I created a balloon installation consisting of white balloons of varying sizes at different heights. These balloons had the illusion of floating in mid-air. I achieved this affect by using clear fishing string instead of coloured ribbon. To help illuminate my booth I borrowed lights from my vendor friend Ally Papko Photography. Lighting is key for any wedding show. It helps brighten up your booth, making it feel warm and inviting. My favorite part of my booth was my Ring Pops. 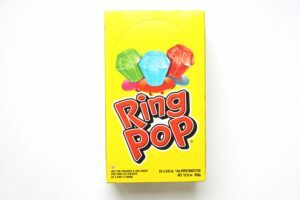 Remember those ring-shaped candies from the 90’s? Well I totally brought them back for the show. 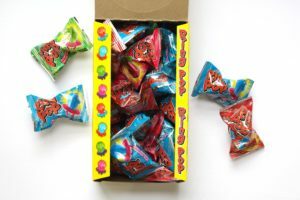 Between the Ring Pops and balloons, I definitely drew on people’s inner child. 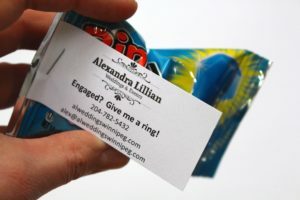 Several of the brides-to-be were so excited to see Ring Pops because their fiancé proposed with one. A wonderful friend of mine worked very hard to design my marketing material. She did an incredible job creating a fresh-looking postcard that outlined my services and contact information. Marketing material is key to having a successful wedding show. I hope brides-to-be enjoyed reading over my postcards and booklets when they got home. I had a wonderful experience at the Big Day Wedding Expo. It was wonderful meeting all the brides-to-be and other vendors. I hope to do another show soon! Do you want a glamourous, relaxed, or formal wedding? Check out my Pinterest page for wedding inspiration. When deciding on a wedding date there are many factors involved. Three wedding dates gives you more flexibility, and a higher chance that the vendors you want to work with will be available. The ladies who brunch together, stay together! Coordinate a brunch with your besties at your favorite restaurant. My personal favorites are Cibo, Clementine, Stella’s Café, and the Park Café. Apart from taking selfies with your entourage, a lot of vendors offer Instagram contests. These contests ask you to take a photo of yourself in their booth or with a prop and post it on Instagram using their hashtag. Be ready for your close up by wearing your favorite outfit. You will want your phone charged to enter all the vendors Instagram contests, but you will also want to take photos of booths that catch your eye. Vendor booths incorporate trendy elements that will be popular in coming seasons. Finding a wedding dress can be tricky! Bridal fashion shows give you a chance to see different wedding dress shapes and designs. The advantage of attending a smaller show like the Big Day Wedding Expo is that you can spend more one on one time with vendors. Personality is key when deciding on vendors. Working with sweet, bubbly professionals ensures you have an enjoyable planning experience. P.S. Stop by the Alexandra Lillian Weddings & Events booth to say hi and view our packages. I’m excited to announce that March 4-5th, 2017 I will be participating in the Big Day Wedding Expo. It’s crazy to think that only three years into my business I’m partaking in a wedding show. The Big Day Wedding Expo is hosted at Assiniboia Downs just outside the West Perimeter. The show offers a more intimate wedding show experience. 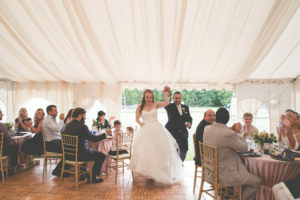 This allows brides and their posse to have a relaxed time speaking with wedding vendors. For vendors it’s important to have time to listen to a bride’s wedding needs. With an intimate show there will be less noise, less crowds, but the same enjoyable atmosphere. 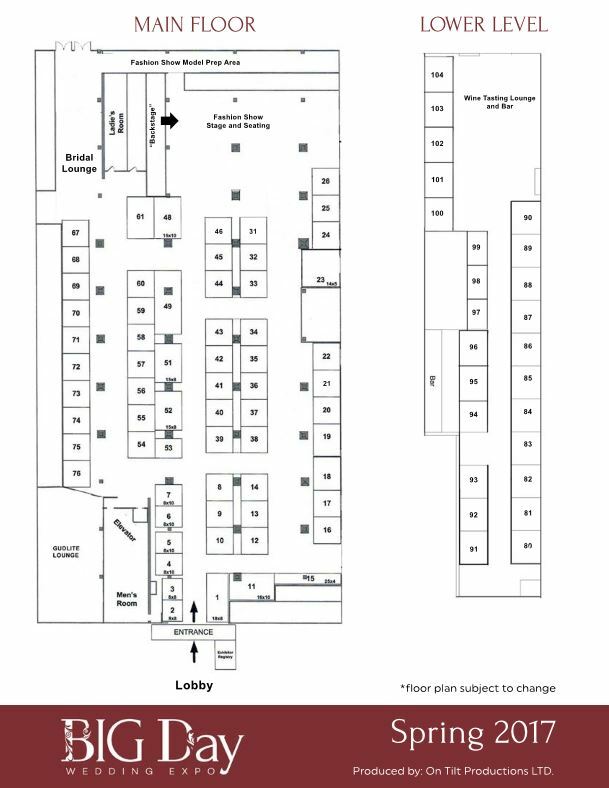 Pop by for a visit March 4-5th at booth 43! In November 2016, my fiancé surprised me with a plane ticket to Toronto to accompany him for a day of sightseeing in advance of a business conference he was to attend. This was my first trip to the city, and little did I know it would be the most memorable trip of my life. After an amazing sleep at the Fairmont Royal York on Friday night, we awoke early Saturday morning to take in the city. After a full day of exploring downtown Toronto (including Eaton Centre and the Royal Ontario Museum), we got decked out for a nice dinner at Cluny Bistro in the historic Distillery District. My fiancé told me that it was a very fancy restaurant, so I dressed accordingly. However, he decided to wear red denim… a questionable choice for a fancy restaurant, but I didn’t say anything about his decision. As Cluny Bistro is right along the main road of the Distillery District, we were also treated to the Toronto Christmas Market. This is an annual pop-up market which includes several historical fenced in blocks and numerous vendors selling seasonal products and gifts (as well as kiosks with hot chocolate, a Ferris wheel, carousel, live band and bars). The cobblestone streets and red brick buildings serve as the perfect backdrops for a Christmas market. After dinner, we had the chance to walk around and take in the sites. We eventually came across a large “love” marquee sign. My fiancé covertly asked if I would like to get a photo together. I needed a new Facebook profile picture, so of course, I said yes. My fiancé suspiciously handed his phone off to someone in the market… This person happened to have two large cameras strapped to himself, this was odd, but I didn’t think much of it. As I started to position myself in front of the marquee sign, my fiancé turned me toward me. He said, “I hope you have had a wonderful trip.” I felt him reaching for his pocket, and get down on one knee. I was overtaken with joy that I could not look away from him. With over a hundred people clapping and cheering, all I could see was him. No words can express the happiness I felt at that moment. The love of my life wanted to spend the rest of our lives together. The man who took our photo came up to us, I initially thought to return my fiance’s phone. As it turned out, my fiancé pulled out all the stops and had hired him, a professional photographer, to capture our proposal and take photos of us for the evening. My fiancé had never met the photographer before, and my fiancé told him to look for the guy matching is description wearing red denim. Now the red denim and two large cameras made sense! That night we celebrated our engagement with two close friends in Toronto. Wandering around Queen West in the wee hours of the morning, we caught the first snowfall of the year. It was the perfect way to spend our engagement! On a cold winter day like today, it’s nice to reminisce on warmer times like this fall country wedding photoshoot. In October, 2016 me and a group of talented vendors got together for this shoot. This shoot began with an idea and design concept put together by me and photographer, Ally Papko. With our vision board, we approached other wedding vendors to see if they would like to participate. We were happy when everyone agreed, and our vision came together on that October day. 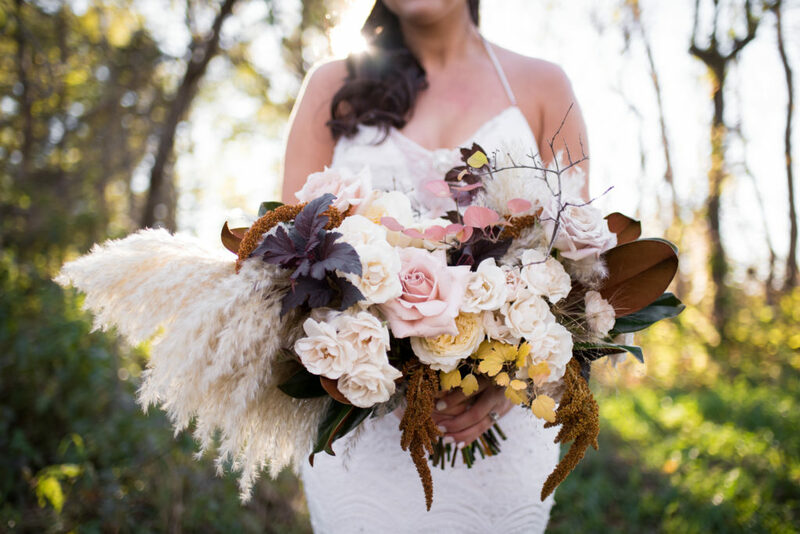 Every vendor’s personality and creative flare made this shoot truly special. I met Deanna Rogers-Murray of Deer Dutch through Instagram. I was blown away by the care she put into her floral arrangements. Every detail is specially placed to create a breathtaking bouquet or centerpiece. Adding to the excitement, just days before the shoot she launched her new website http://www.deerdutch.com/. If you haven’t already, take a peek at her website. Deanna was a treat to work with. Her bubbly personality added to the atmosphere the day of the shoot. Aynsley Rosin (Co-Owner of Sweet Impressions Bakery) creates the sweetest treats. We have been friends for a while, and I was so excited to finally work with her. She went above and beyond taking our vision and bringing it to life. Have you seen that cake? Not to mention the chocolate covered apples! When Aynsley cut the cake, I swear I have never seen anyone move as fast as all us girls. We all wanted to try a taste. Needless to say, we all died and went to sugar heaven. Mhei Alcos of La Estetica Beauty was wonderful to work with on the shoot. She created the perfect sultry eye, and luscious lip for our model. She was very professional, and sweet. How cute are these photos Ally captured of Mhei? Krissy Lamirande is an incredible hair stylist! After looking at the style of wedding dress for the photoshoot, she was able to suggest and create the perfect hair-do. After seeing the amazing job she did styling our models hair, I booked an appointment with her of my own. It was the best decision I have made. She is kind, personable, and truly listens to what you are looking for. Lainie Payjack is truly a stunner with a heart of gold. We grew up in the same neighbourhood, and have known each other for quite a while. There was no one else I would have wanted to model in this shoot, she absolutely killed it! 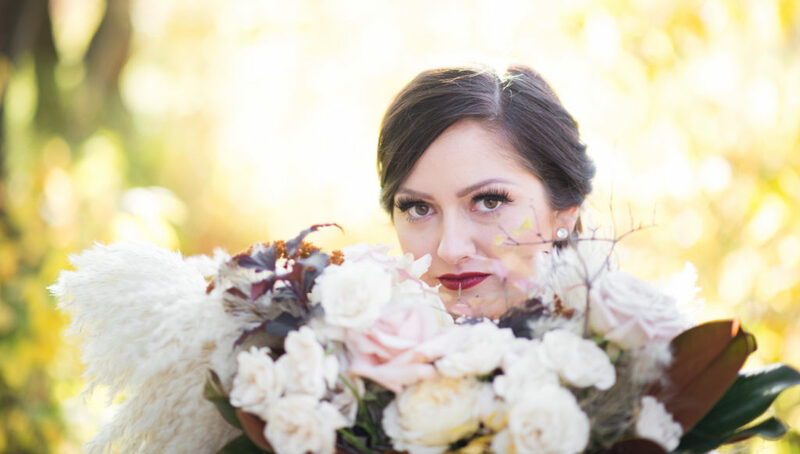 I could not be happier that Ally Papko contacted me to create a styled wedding photoshoot. We became friends a couple years ago working on a mutual friend’s wedding. Her style of photography paired perfectly with the style of shoot. It had a modern Snow White feeling. I can’t wait to work with Ally again soon on a wedding or photoshoot. 2016 was an incredible year of “firsts” for my business and me personally. It’s amazing to look back on all that I have achieved over the course of a year. Thank you to all of my 2016 clients for including me in their wedding day. Your trust means the world to me. This year held a lot of gold sequins and stunning cakes! Starting my own business has been a huge leap. I had to trust my instincts and keep pushing to create the best wedding day for my clients. This past year has shown me that I have what it takes to make it in the wedding planning industry, and I can’t wait for many more years to come! I had the pleasure of working at many new venues this year. 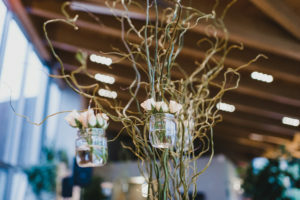 Each venue was special, and had something unique that my clients connected with. I would like to thank all the warm and welcoming venue coordinators and sales representatives that I got to work with. The wedding planning community in Winnipeg is very small. I’m thankful for how supportive all the wedding planners are of each other. Every planner brings their own style and flare to wedding planning. It’s wonderful to have other planners that I trust and can refer couples to if I’m already booked. 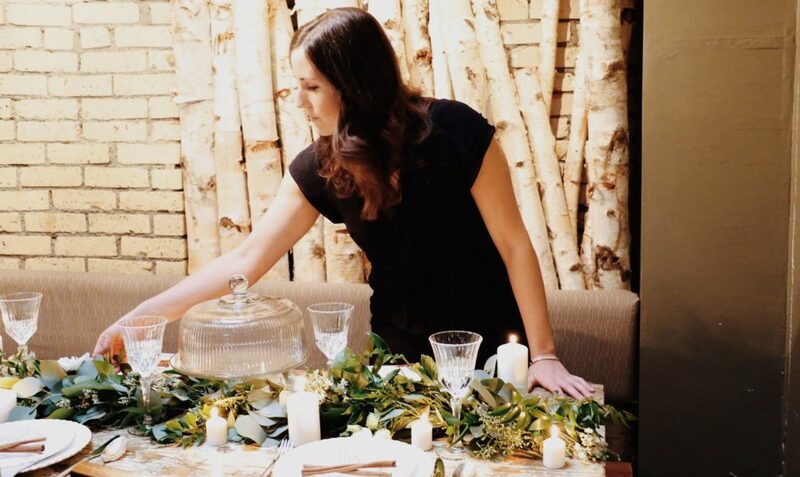 Let’s just say I squealed at the top of my lungs when I was featured on Planners Lounge, Host Winnipeg, and Martha Stewart Weddings in 2016. When my fiancé got down on one knee, I received the most heartfelt and genuine surprise of my life. My best friend and love of my life wanted to spend the rest of our lives together. To top off the evening, he surprised me by hiring a professional photographer to capture our special moment and take photos of us for the rest of the night. I’m so excited to plan my own wedding in 2017. Once I find a venue that fits the personality of me and my fiancé, everything will come together beautifully. Don’t you worry ladies, I will definitely have a day-of coordinator at my wedding. I’m not lifting a finger on my big day! I have just the girl in mind to help me out (wink wink). Stay tuned to see more photos of my engagement! Your family knows you better than anyone (except maybe your husband to be). Make sure they feel included in your engagement by giving them a phone call first to break the news. If your fiancé is traditional, it’s likely that he would have already asked your father for his permission beforehand. They might have known the engagement was coming and it may surprise you to know that they counselled your now fiancé more than you would have expected. Don’t leave out any of the details, these are memories to keep for your entire life. After family knows the details of your engagement, it’s time to perfect your ring selfie. Maybe give yourself a quick manicure and take a few photos OR click the link below for some engagement announcement ideas. Once you have carefully worked out your wedding budget with a wedding planner, it’s time to send out invitations. Everyone’s budget for stationary is different, but one thing should stay the same, always send a paper invitation to guests. Couples with a medium or larger budget for stationary can look into hiring a local boutique stationary designer. With a local supplier, you are able to see samples of the product before placing your order. This allows you to make sure every detail is perfect whereas reviewing proofs online can cause you to miss smaller details. Couples with a more restrictive budget can look into online printing services like VistaPrint (http://www.vistaprint.ca/). Online printers have improved significantly over the past couple of years and I am consistently impressed with the quality and speed of the work. There are now choices for premade templates, paper thicknesses, gloss and custom finishing / cutting. This is one major faux paux that many couples make when sending out their invitations. Then how should guests find out about the registry you ask? Your registry can be linked on your wedding website, shower invitations or communicated in person. Social media is a wonderful tool for letting guests know about your wedding. You want guests to share in the excitement of your big day, but ensure they are present by having an unplugged wedding ceremony. 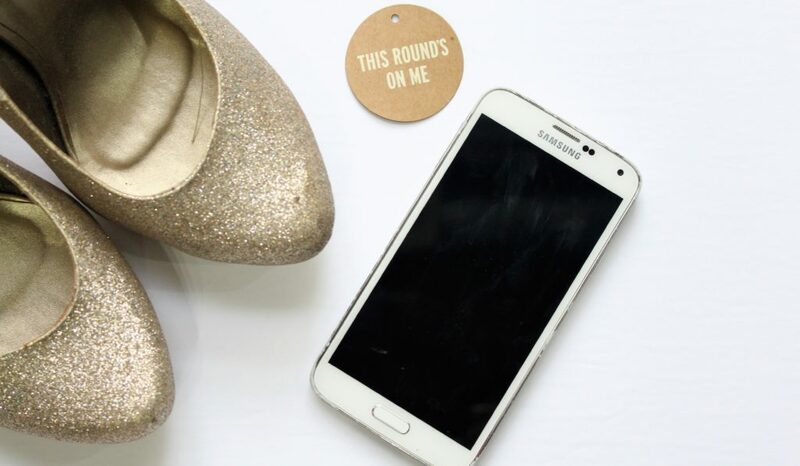 Two ways to ensure guests are not on their phones during your ceremony are having a cute framed sign at the end of the aisle asking guests to please stay off of their phones or having the officiant explicitly remind guests to turn off their phones. Phones off will make sure that guests do not become paparazzi, and get in the way of the photographer. A good wedding photographer is not cheap and having guests in their seats allows them to move around freely and capture every special moment. A simple thank you card goes a long way to make guests feel special and appreciated for joining you on your wedding day. As tempting as it may be to type your thank you cards, it’s important to have them hand printed. This shows that you took extra care and love into thanking guests. It also allows you to personalize each letter. Make reference to something they did or gifted you. Common etiquette is to send thank you cards between one and three months following the big day. Choose a date: You will never satisfy everyone, but be sure that the people most important to the bride are able to make the event. Also be wary of competing events (especially those related to another bride in the same general group of friends). 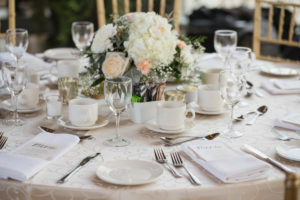 Choose a venue: It is common to host a bridal shower at a community club, restaurant or country club. Don’t underestimate the amount of work and space required (ie: be triple sure that the host knows all that is involved if you decide to do it at someone’s house). 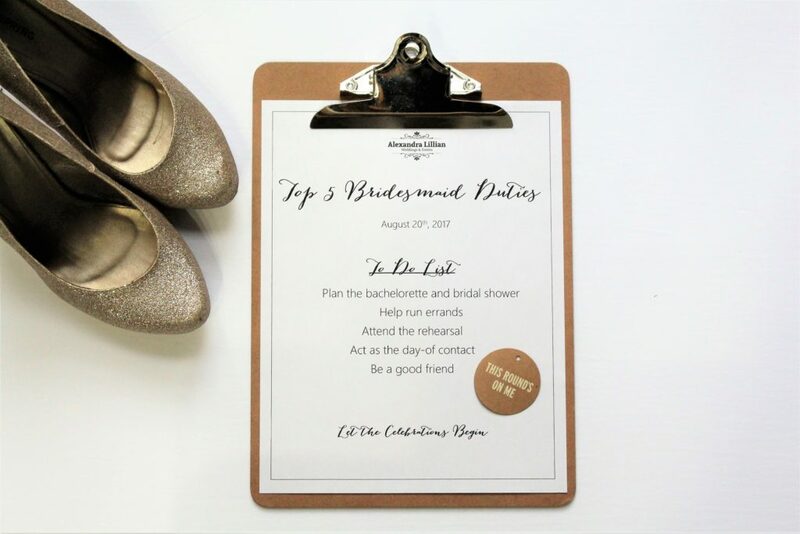 Create a guest list: Be sure to put together a formal invite list and run it not only by the bride, but also the other bridesmaids. Missed invites (even if unintentional) can cause feelings to be hurt and can take away from the events themselves. 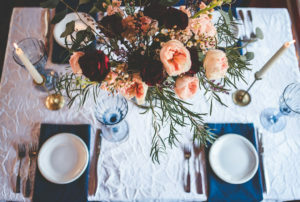 Choose a theme: The theme you choose will set a tone for the event. Think about your bride’s interests and hobbies. Is your bride into the outdoors? Why not rent out the warming hut at the St. Vital Duck Pond? Send out invitations: While formal invitations are still the norm, e-invites have become more commonplace. 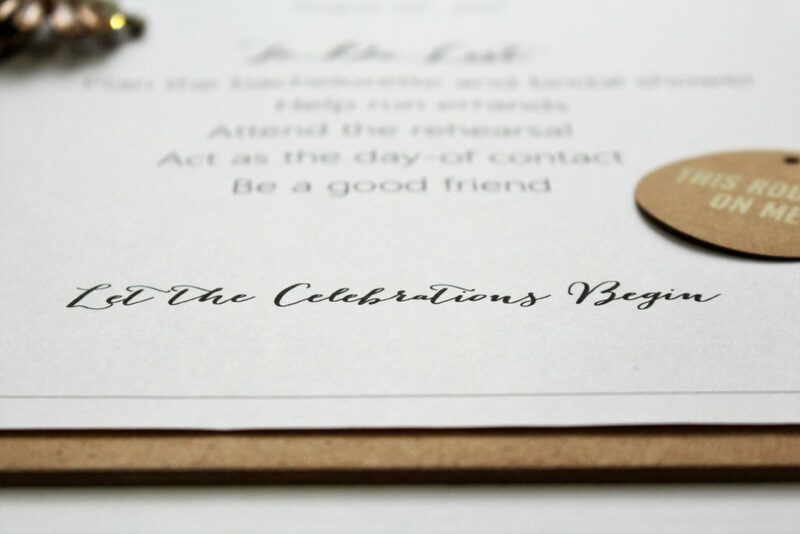 If you are on a budget, don’t feel pressured to spend more than you need on invitations. Remember those fun napkins from the décor company? Offer to pick them up before the wedding as this will relieve a lot of stress off of your bride. With one less thing to do she will be able to focus on last minute details. No matter if it’s your first or fifth time being a bridesmaid, it’s always important to be there for the wedding rehearsal. 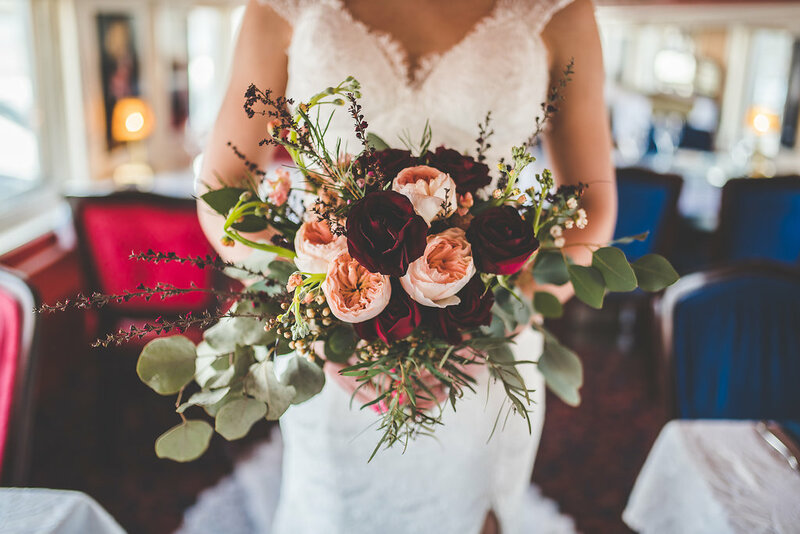 The officiant or wedding planner will walk the bridal party through the ceremony until everyone feels comfortable and confident for the big day. The wedding rehearsal takes place one or two days before the wedding. Remember that while it is common to have a couple drinks the night of the rehearsal, do not overindulge as the next morning is commonly an early one with a lot of responsibilities to come your way. Your friend will most likely have a wedding planner helping her on the big day. Offer to be the day-of contact for the wedding planner. This will allow your bestie to relax and enjoy being pampered on the morning of her wedding. As the day-of contact you will be the point of contact for the planner to check in and see how everything is going and ensure the day is running on schedule. Don’t worry, this job is super easy! All you have to do is keep your cellphone nearby to respond to the odd text message or phone call. Maybe send a few selfies of the girls over to the wedding planner, it will definitely brighten up their morning. Your friend chose you to be a part of their wedding day because they love you to the moon and back. Planning a wedding can be a stressful time, show the bride kindness and support throughout the planning process. Remember, this is the brides wedding day NOT yours. Be a kind word of reason, but do not be negative and always look for the positive in situations (even if the decisions don’t necessarily reflect your personal preference). Take your friends mind off of planning and go for a drinks with the girls one night. This will allow you to cut loose and take everyone’s mind off of the wedding. Cosmo’s anyone?